AstroQuick 7 softwares work with any computer providing a browser and an internet connection. AstroQuick 7 is 100% compatible with PC Windows (XP / Vista / Windows 7, 8 and 10) and Apple Mac OS X (Intel & PPC) with the browsers Firefox and Safari. 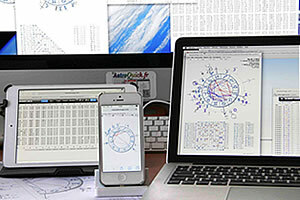 It also works on Apple iPhone and iPad, Android, netbook and Linux. AstroQuick 7 will automatically work with the recent versions of Mozilla Firefox and Apple Safari, however other browsers that respect the standards Web 2.0 can also be used like Opera or Chrome *. Even if it's better with, a high-speed connection isn't indispensable, you can also use AstroQuick 7 with any low-debit connection (modem or edge). Download and use Firefox for free by clicking here. Download and use Safari for free by clicking here. Download and use Chrome for free by clicking here. Very precise calculations over up to 5000 years of ephemeris: positions of planets (Sun until Pluto), Lunar nodes (mean and true), Dark Moon (mean, corrected and true), 5 asteroids (Ceres, Chiron, Pallas, Juno, Vesta). Tropical Zodiac and sidereal zodiac with 7 references: Djwal Khool, Ayanamsa Lahiri, SVP Fagan, Deluce, Bhasin, Raman et Krisnamurti. 19 Calculations of domification (Placidus, Regiomontanus, Campanus, equal houses, Porphyre, Meridian, Koch, Antique, Nodal, Solar, Lunar, Mercurian, Venusian, Martian, Jupiterian, Saturnine, Uranic, Neptunian, Plutonian) with display of the part of fortune. 11 major and minor Aspects (0°, 30°, 45°, 60°, 72°, 90°, 120°, 135°, 144°, 150°, 180°). Timetables in more than 300 countries or regions are automatically calculated (time zones; regularly updated). Other entry options in Universal or Local time. Geographic coordinates of more than 70.000 cities in the world, search by city, region, country, latitude and longitude. Possibility of typing the city with geographic latitude and longitude (degrees and time conversion). Up to 16 sky charts simultaneously opened. Birth and hourly charts, with automatic data capture. Astral clock with lunar phases and lunations. More than 5.500 celebrities and events charts with date and place, available in a search engine by name, by date and by popularity. Charts : Ephemeris, Solar Return, Lunar Return, Secondary directions, Solar or Symbolic Arc with converse options, Lunations (4 soli-lunar phases), Synastries (superimposed charts with compared aspects), Mid-points (2 charts), Mid-space/time (spatiotemporal), hourly transits, minor and major (monthly or yearly with converse options). Solar Ingres (12 signs), lunations and 4 lunar phases. Positions of the elements of the chart with indication of the positions in sign, house, aspects. Aspects charts with analysis of the orbs. Multi-period ephemeris tables with positions of the planets, lunations (4 phases), lunar nodes (mean and true), dark moon (mean, corrected and true) and asteroids (Chiron, Ceres, Pallas, Juno and Vesta). Planetary longitudes in tropical and sidereal zodiac (7 SVP references). Periods of 1 month, 6 months, 1 year, 2 years or 12 years with fast browsing adapted to touchpads like Apple iPad or Google Android. Lists of dates of transits and directions periods (secondary, symbolic and solar arc progression) with automatic settings. Settings as for the period, transiting planets, transited planets (natal positions), zodiacal reference. Options of converse calculations (before birth). Aspects tables classified and presented according to 7 criteria: the transit date, the birth chart, the aspects, the periods, the zodiacal longitude, etc. Calculations periods of 1 month, 6 months, 1 year, 2 years, 10 years and 84 years with fast browsing adapted to touchpads (extra fast calculations with easy settings). Monthly transits with time of lunar aspects. Calculations of transits of all the planets (from the Sun to Pluto) and asteroids (Chiron, Ceres, Pallas, Juno and Vesta) on all the points od the chart, expect the natal positons of Pallas, Juno and Vesta. Listing of the transits and directions dates (with aspects and periods). Listing of the dates of transit with their symbols (key words clouds, help as for the edition of individual studies). Interpretations of Astrotransit planetary transits (transiting from Pluto to Venus). Presentations of the zodiac depending on Aries, the Ascendant or the Ascendant of the birth chart (related charts and synastries). Calculations in tropical and sidereal zodiac with choice of 7 SVP references. Associated graphic options. Bi-Wheel chart with both tropical and sidereal zodiacs (graphic option). Graphic options for colors and displaying of all the elements of the sky chart (zodiac, planets, signs, houses, aspects) avec general control of the chart window. Graphical options for drawing houses in a circle and displaying their number/id. Possibility to display or not the planets, asteroids and special points such as the Part of Fortune, Dark Moon, North and South lunar nodes, domification, aspects for the ascendant, Midheaven, North Node and Dark Moon. Possibility to apply calculations and graphic preferences of a chart: copy/paste option giving you an infinity of settings and personalized options. Ability to add a text note and the 7 rays ID (Soul, personality, mental, astral, physical). Downloadable PNG & JPG pictures: sky chart, aspects charts, comparisons, planetary positions and houses. Vectorial PDF reports of the charts (simple or compared). Standard format adapted for enlargement and all the computer graphics work and high resolution printing. Interpretation help by clicking on the element of a chart (planet, cuspid or point) with zodiacal sign key words, decan, house, Sabian and symbolic degrees, and lists of aspects. Interpretation of the birth chart AstroBasic, Ascendant and planets in sign and houses (until Saturn): about 6 pages. Help as for the editing of personalized interpretations with listing of the positions and aspects (birth chart, comparisons, returns and dates of transits). Publication of changeable files with all the editing softwares (word processing) Mac and PC. More than a dozen of interpretation modules available as options. The lists of charts can be changed with other softwares (chart files with 100% compatible text/chart). Automatic backup with recovery of monthly and daily files. Transfer of the graphics with a simple downloading : sky chart, aspects charts, comparisons, planetary positions and houses. PDF printing report (vectorial format) for a high resolution printing or emailing. Copy of astrological data: Planetary positions, aspects, astrological data, list of transits. List of celebrities and key words clouds (help for editing). Publication of personalized interpretations that can be emailed with a sky chart. Commercial licence of the printed or emailed documents. Interpretations with graphs and hypertext interactivity. Vectorial PDF report for high resolution printing including the picture of the sky chart with a detailed report; name, birth data, planetary positions, domification, aspects chart, saved settings and personalized signature (your name and internet address). PDF printing report for charts comparisons with détailed interaspects, planetary positions and summaries. Lists of dates et periods of transits and directions on 3 columns with 7 options of presentation. No installation : no setting, it is so easy ! No hardware dependence ; you can use any computer as long as they have internet connection. On old PC Windows, it is recommended to install Firefox or Safari. Internet Explorer is only compatible with the version 8 and after. 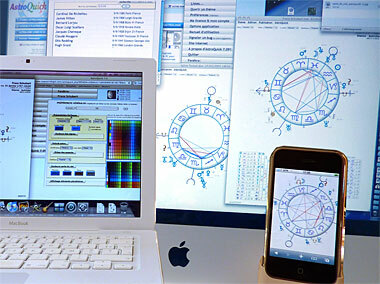 You will instantly find all your astrological settings no matter what computer you use (PC, Mac, iPad etc.). No electronic key : AstroQuick softwares don't need any protection electronic keys and will never create any problem when it comes to hardware (material) or software compatibility. 100% safe and available : AstroQuick WEB works on the best professional servers with no pop-ups. Already compatible with new and future systems : Mac OS 10.9, Mac OS 10.9, Mac OS 10.10, Mac OS 10.11, Mac OS 10.12, Windows 7, Windows 8, Windows 10, iOS 5, iOS 6, iOS 7, iOS 8, Android etc. User guide with interactive references, tips and tutorial videos. The use of AstroQuick is submitted to the acceptance of a licence contract that defines the limits and rights of use of the software. There are only 2 uses provided: a personal use at home (versions ECO, PERSO, PLUS, CLASSIC and DELUXE) and a professional use allowing you to commercialize astrological interpretations (version PRO). The versions PERSO and above allow you to use calculations ans sky chart (for any astrologer) whether it is professional or not. Click here to read the licence contract. * Microsoft™ Internet explorer™ is compatible from the version 8.